Like a Stan Lee story, mild-mannered printing company director Scott Knopf transforms into a full-fledged rap beast when exposed to a microphone and an instrumental—but he’s actually more Jigglypuff than Hank McCoy. In his music, and live performances for that matter, Rhyme Time gives you all he has vocally, physically and creatively. Gnarly, his third studio album, was delayed and re-released due to him and his bandmates, House of Lewis, making an appearance on America’s Got Talent. Technically, you could say that he’s reached the national or even international scale at this point. The 11-track offering, Gnarly, is bubbly, jazzy, synthetic and soulful (and skillful). It’s a nostalgic encapsulation on everything Knopf likes or liked about the ’90s, so put on your neon tracksuit and pop the CD in your boombox for a listen. Knopf brings his usual antics—writing songs about partying with Snoop Dogg, partying in general, wrestling, namedropping his favorite celebs and even sending a gumshoe to spy on his wife. Some fans might find it a bit too comical or jovial for their liking, but I find it refreshing to listen to a rapper who has no qualms with being a good guy (with good literary devices, of course). 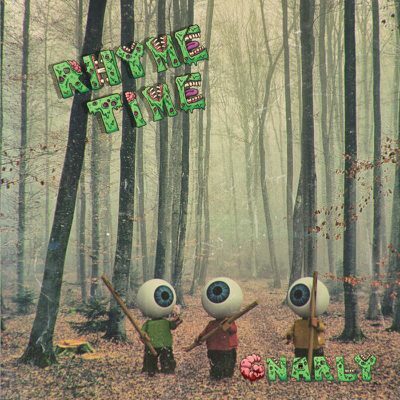 The title track stands out, as well as “Bringing Saxy Back” and “Name Droppin’.” Charming, witty and full of passion, Rhyme Time has without a doubt earned his place in the pantheon of dope Utah emcees.